I've heard people say how difficult it is to find spices in Japan and that you should bring your own. While from personal experience I know there are some spices and herbs (like cilantro) that are a little more difficult to find, especially if you, like me, don't live in Tokyo or another huge city, in general it's not (usually) that difficult, and certainly not impossible to find a variety of spices and herbs in Japan. Yes, even if you live far from civilization. I've also heard some people complain that if it's not at any local stores, then it's basically impossible. Personally, I think ordering online is far easier and faster than going shopping in person, so while yes, it could require a bit more planning ahead of time for whatever exotic meal you plan on cooking up, I wouldn't consider it "impossible." But to be honest, I just adapt dishes when I can't find what I need and I want to make something I'm craving right away. Although sometimes I crave food from specific restaurants that aren't in Japan, but that's not really relevant. To each his or her own, though. You might be looking for spice blends as well, similar to those you got back in your home country. You can find quite a few of these online too, I discovered, but it's really easy to make your own spice blend buying the single spices or herbs and mixing things together. 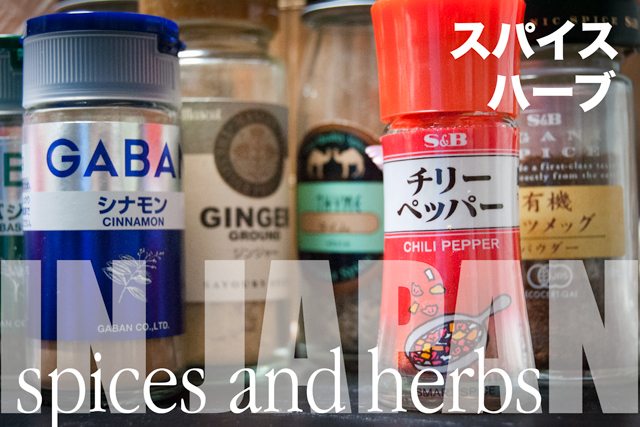 In this post we'll look at some of the common spice/herb brands in Japan, words that you should know, Japanese translations of spices and herbs, where to find spices and herbs in Japan, and some ideas on how to find some of those more elusive seasonings at the end. So let's jump in! McCormick マコーミック (by Youki) - I've never seen this brand in regular stores, but if you have, let us know. FAUCHON (フォション) - Technically these fall under the S&B brand, but they are labeled differently than the regular S&B and the organic line. My local supermarket also has a brand called Eurasia, which carries far more kinds of spices than most of the other brands the same store also carries (such as Gaban and S&B). Brand "Eurasia," which is imported, and they have a big selection. Your location in Japan will have everything to do with this in terms of what spices and herbs are available in your area. In my experience, most supermarkets carry a set of basics, and some supermarkets carry a larger selection than others. There are a few supermarket chains where I live now, and one of them carries a large selection of spices, herbs and seasonings, but it also carries more imported and organic goods than the other chains do. So my advice is to try and find the supermarkets that carry more imported products near you if possible, as they will probably offer a larger selection. Some people think ordering online is an inconvenience. I completely disagree (it's faster and easier for me), and you'll usually be able to find what you need. And delivered straight to your door - so easy! First of all, some of the brand sites above have online shopping. Spice Luck - Wide variety of spices, herbs and seasonings, most in bulk. Ohtsuya - Spices, herbs, nuts and other items, often available in bulk (I've ordered bulk nuts from here several times). Spice Stock - Again, a large selection of spices, herbs and seasonings, most in bulk. Kenko.com - You'll mostly see the types sold in stores here. You can also shop in English, although the selection is a bit smaller. Tengu Natural Foods - Smaller selection of herbs and spices than the above options, but still a good resource, and in English. Rakuten shops - You can use the search function and the keyword of the spice you're looking for. Import stores - All the ones I've been to have good selections of spices, herbs and seasonings from around the world. Many stores are independent and region specific, but you might try looking for Kaldi or Seijo Ishii (if you have any recommendations of import stores specific to your area, let me know). Department store basements - You know the places with tons of food and shops? You might come across some spices there. (Thanks Kirsten for the tip). Shops such as Foreign Buyer's Club, Yoyo Market and The Flying Pig. Spice Home carries Indian spices. Online store, and if you're in Tokyo, it's across the street from the Grand Hyatt Hotel in Roppongi Hills. (Thanks to Garden Clinic Hiroo for the tip). Maya Bazaar carries a variety of spices and ingredients for Indian cooking and you can shop in English. They also mention the quality control isn't the same as in Japan as the products are imported. Some spices and herbs can be a bit more difficult to find, no matter where you are. Let's look at a few, and if you're stuck trying to find something, let us know in the comments! Please note you might be able to find these items at other stores, both online and in person. I just want to provide some online options for those who are stuck. All links go straight to the spice listed rather than the site's home page. My American self didn't realize cilantro was also coriander until more recently! No wonder I had more difficulty tracking this down in Japan. You'll want to search for コリアンダー葉, 香菜, パクチー or similar terms. Interestingly, our local supermarket actually had fresh cilantro the other day! Surprising. If you can't find it nearby or at an import store, you could try Tengu Natural Foods, Kenko, Spice Luck, iHerb or Ohtsuya. I've never had problems finding this one, but I've heard a few people say they've had trouble. In English, try Tengu Natural Foods (or another online store of your choice). In Japanese, these options are helpful: Amazon Japan, Kenko, Spice Luck, Spice Stock, iHerb or Ohtsuya. Not to be confused with chili pepper or chiles (the red, hot stuff). You may or may not see this one in your local store. I've seen it some, and not in others. You can also find it at Kenko, Ohtsuya, Spice Luck, Spice Stock, iHerb or Amazon Japan. Similar to the above: Kenko, Ohtsuya, Spice Luck, Spice Stock and Amazon Japan. In English, check out Tengu Natural Foods or iHerb. In Japanese, try Spice Luck, Amazon Japan, Spice Stock and Kenko. Find this item at Kenko, Spice Luck, Ohtsuya, iHerb and Amazon Japan. Remember, too, that you can easily grow herbs here in Japan. I've had some containers of herbs on the balcony and most have done pretty well (at one point my basil plant became a bush and we had pesto every other day for a while). This is a post to go into another day though. Do you have any resources to add? Any suggestions for where to find spices or herbs where you live?